Peer Instruction, unlike many other PER-based teaching methods, does not require the using of teaching assistants in class. However, if you do have access to teaching assistants and/or learning assistants, they can be helpful in making Peer Instruction run more smoothly. At the University of Colorado, learning assistants are often required to attend lectures and circulate through the room during ConcepTests to help facilitate discussions between students and listen to student thinking. They then meet with the instructor weekly and report back on what kinds of ideas they heard in student discussions. Having "spies" in the room can be helpful in getting feedback on student thinking, since the instructor can usually only listen to one or two group discussions during each ConcepTest. Also, students may be more comfortable saying what they really think around other students closer to their own age than around the instructor. Having assistants to help facilitate group discussions can be helpful for making sure students have productive conversations, particularly in large lectures where the instructor cannot get to all the students. In general, teaching and learning assistants should facilitate conversations by asking questions that get students talking to each other, not by having a lengthy discussion of the content with a single student or by explaining the correct answers. Before the course begins, we explain to our TAs the reasons for teaching with PI and give them the data on improved student learning... One way to help TAs see the value of PI is to have them think about and discuss challenging ConcepTests, so that they experience the benefits of discussion. If such ConcepTests are related to the course material, this also makes them realize that they don’t know everything already! 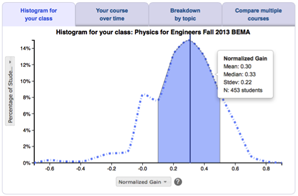 (Questions on introductory fluid statics and dynamics are usually challenging for our TAs.) At Harvard, we hold a weekly meeting for our teaching staff, during which we go through the material to be covered the following week in section, emphasizing the pedagogy we wish them to use. C. Crouch, J. Watkins, A. Fagen, and E. Mazur, Peer Instruction: Engaging Students One-on-One, All at Once, in Research-Based Reform of University Physics (2007), Vol. 1. Do you have suggestions for training TAs for Peer Instruction? We'd love to hear about them!